The following is a guest post. Andrea Woroch is a consumer and money-saving expert who shows people how they can live on less without radically changing their lifestyles. From smart spending tips to personal finance advice, Andrea transforms everyday consumers into savvy shoppers. She has been featured among top news outlets such as NBC’s Today, Good Morning America, Dr. OZ, CNN, New York Times, Kiplinger Personal Finance, and many more. Follow her on Twitter or Facebook for daily savings posts. We’re all guilty of making bad buying decisions from time to time, and that’s Okay. Just as long as you can identify the mistake and learn from it. However, when those occasional poor purchases turn into a behavioral pattern then you may have a much bigger issue on your hands. Paying little attention to your bad buying habits will ultimately effect your bottom line. Since these behaviors aren’t limited to spendthrifts either, it’s time to get a handle on your shopping indiscretions before it’s problem. 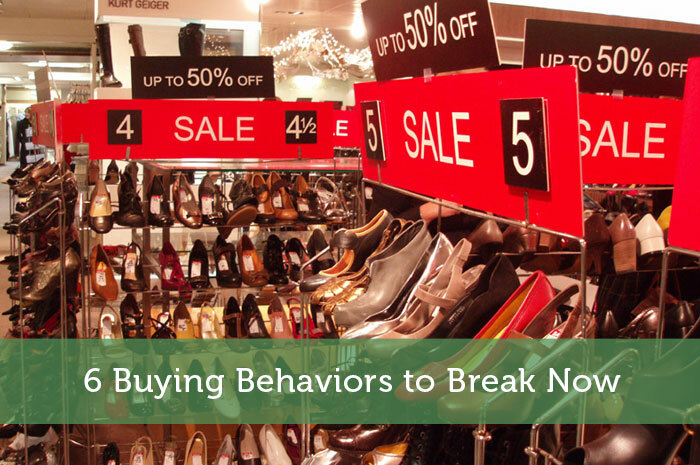 Here are 6 bad buying behaviors to kick before they become a habit! Impulse-buying is an obvious starting point when discussing poor purchasing habits, but I was surprised to learn just how huge an impact it has at the grocery store. I recently read an article in Spirit Magazine that said impulse purchases represent over 50-percent of everything we buy at the supermarket. Sticking to your list and avoiding temptations at checkout, end caps and bargain bins will keep you from making this costly mistake. The best tip, however, is to limit the number of trips you make to the store. Plan ahead and aim to grocery shop just once a week. Otherwise, challenge yourself to shopping just twice a month and see how much you save. The same goes with bulk retailers and department stores: If you can’t control yourself, just don’t go into the store and shop online instead. Most practical people would never purchase anything deemed unnecessary, but some salespeople do a great job of making things sound important. Extended warranties, for example, may seem like smart buys as your shelling out cash for a pricey electronic purchase. However, the manufacturer’s warranty is usually sufficient, plus some credit cards offer additional coverage. Failing to compare prices or find coupons for a purchase is just pure laziness, especially with the abundance of apps and websites that make it easy to compare and save. I search for printable coupons using my phone app for in-store savings so I can access deals when I’m on the go. Plus, I often forget to bring the paper coupons with me. I also compare prices with the RedLaser app so I know I’m getting a good deal and use the data to negotiate or ask for price matching. Not much effort needed with these helpful tools! The term “spaving” — not to be confused with the “perceptual contrast principle” — refers to “spending to save” and we’re all guilty of it. It happens when you intend to buy one of something, but end up with two, three or even 10 because of a “buy one, get one” promotion. Spending $50 to earn reward points when you only intended to spend $30 is another example. And finally, daily deals are the worst offenders, tempting you to spend money on dining, activities and even vacations because they’re such a good deal. Remember, these multiple deals are a marketing tactic designed to get you to spend more. Keep this in mind the next time you are tempted to stock up and shop with cash to reduce overspending. I’m not a terribly confrontational person, but when I take the time to print a coupon or visit a store because of a promotion, I feel pretty cheated when I don’t get the discount. Too often, patrons will simply brush off the potential for savings in the spirit of politeness. However, it’s always best to speak up when you feel you’ve earned a discount in good faith. More often than not, retailers will honor a discount or coupon when you simply ask. Getting to know a sales associate is another great way to find out about upcoming sales or special promotions, so don’t stay quiet. “Would you like to open a store card today and save 15 percent on your purchase?” The prospect of saving money is a powerful motivator, but opening store credit cards for one-time discounts is a bad habit. Doing so results in a “hard inquiry” on your credit report which can lower your score. High interest rates coupled with a barrage of marketing messages aimed at making you use the card more could land you in a world of financial trouble. Get in the good habit of saying “no” whenever a sales associate asks you about opening a line of credit. So how much did you actually spend? If you made a $50 purchase but saved $20, then no. But yes if you ended up spending $20 more than you intended to. Those coupons are a marketing tactic that gets people to buy more. Don’t worry, we all do it. Just be aware of it next time and stick to your budget! A lot of times, those coupons come with strings attached, like: you must spend at least $50 to use the coupon! Great point and tip! If I feel the urge to “window shop” then I leave my credit cards at home and travel with a little cash for emergencies, but just walk without the opportunity to buy. If I find something I just must have, I can put it on hold. Usually though, I never return to actually buy it and fulfill that impulsive urge to spend! I would take the store discount and repay the balance in full, if that is an option. It does require discipline, but like any credit card, you can make them work for you. Agreed! Credit cards are what you make of them. If you shop at a store frequently, then the store card offers benefits and rewards that can help you save. But yes, it takes discipline! Procrastinating and impulsive buying. I need to work on these more. and i need to be vigilant on those promotional schemes retail stores are doing to lure me in. Sometimes just not going to the store is the best cure for spending! “Spaving” may be my favorite new term! I fear that laziness is probably my #1 offender. I don’t shop frequently so gravitate towards sales on the racks, but I often fail to check all the online resources. Your point about the grocery store is great too! If you don’t stay within your needs (and means) you end up throwing money away, especially because produce can go bad so quickly. You need to download the RedLaser app! It provides instant price comparison when you are in store, so even lazy people can compare quickly and find the lowest price hassle free. Yes! Only shop when you absolutely need something. The same applies for online shopping. Browsing the Internet when bored could lead to even more impulse buys since there are so many options online. Like you said, simply considering how the money you are about to spend on something you don’t really need could help toward your financial goal like a vacation or paying down debt will help break the impulse to buy! Great tips! I think my biggest spending problem is with “small purchases”. I always say to myself “oh, this is only $5”, and then I end up buying 10 $5 things! My fiance does the same thing! The small purchases are the biggest money suckers because people don’t realize that every $1, $5 and $10 adds up quickly. Go for a no-spend week (as best you can) and see how much money you have in your account! I used to fall victim to impulse buying and it wasn’t pretty. I have gotten control of it over the years and it doesn’t really affect me anymore. I love the term “Spaving”. This one makes me laugh when people spend more because they can get one free. My dad is guilty of this. Whenever my friends brag to me about a great item they got on sale, I ask of it was for an item that they planned to purchase in the first place. the answer is usually; “well, no, but it was such a good deal!” It’s all too common! Impulse buying is almost never a good idea so it’s great that you’ve reigned it in! “Spaving” is the perfect term to describe this behavior, isn’t it? I grit my teeth when someone I know tells me how much they saved on something they never planned to buy in the first place! Thanks for those interesting tips! I realized just how important it is to change some of my buying behaviors like spaving and staying quiet. I guess, the bottom line is to just buy the things we need and do our best not to overspend. Exactly. But remember, you don’t have to give up everything. All in moderation! If I am feeling an urge to spruce up my wardrobe, I make myself take a few older items out of the closet and sell it at a consignment store or on eBay. This way I can supplement the new purchase. Donating is helpful too. That’s so true! Recognizing these behaviors is the first step toward changing them. You might be surprised how effective it is to realize “hey, I didn’t intend to buy this so why is it in my cart?” or “I really should get this discount…maybe I should say something.” The first time is the hardest but I bet you’ll realize how easy it is after that! I’ve never heard the term “Spaving” before, but it’s appropriate. Spending more to save money can lead to big trouble. Absolutely! I have a feeling we’re going to hear a lot more about “spaving” as more people recognize it as a budget saboteur. The best thing I’ve done to stop spending money is to avoid the stores. You can’t spend if you’re not there. It’s a bit hard at first if you shop out of boredom or for “retail therapy”, but finding other ways to fill that time saves big bucks. This is definitely a great way to curb spending. I look for other ways to occupy my time when feeling bored. I go on a walk, to the gym or ask friend over for dinner! That’s a great point, Kim. If you don’t have the money or the room in your budget, the best way to avoid spending is to just stay away from stores! This is especially true since salespeople are doing things like handing out coupons in-store or giving you “secret” rewards cards to get you to come back. Sneaky sneaky! One of the best tips I give about going grocery shopping is something I call the “Santa Effect” which is; make a list, check it twice, and then stick to it and don’t deviate! The grocery stores spend millions on learning buyer behavior and know you better than you know yourself! Great insight, Lou. I always tell people that sticking to their list is one of the best ways to avoid overspending. You’re absolutely right that practically everything sold to us is by companies looking to make a profit, and they’ll design ways to get us to spend without us ever knowing it. Knowing the system and how to play the game so you come out on top is the ultimate savings tip! OMG.. I never even gave it a thought until I read this post.. I think I have been guilty of every single item listed at one time or another. I have never been good at staying quiet.. that’s probably the only thing on the list I don’t have to worry about. I have to admit I am guilty of “spaving” on a regular basis. I am happy to say.. I no longer purchase unnecessary upgrades.. and I think I have the “laziness” under control. I am pretty good about searching for coupon codes when shopping online.. or using apps on my iPhone when shopping at brick and mortar stores. My biggest problem is definitely the impulse buying.. although not at the grocery store. I learned years ago to always do my grocery shopping after eating a meal. If you shop when you’re hungry you’ll buy everything in sight.. and more of it.. like that HUGE box of Pepperidge Farm goldfish. I definitely avoid the grocery stores when I’m hungry but sometimes it’s inevitable! If you have trouble with impulse-buying, do your best to stay away from stores when you’re in the mood to spend but don’t have the cash. Avoiding temptation during these moments of vulnerability is key to keeping your budget in check! I have a LOT of store credit cards, but I use them to REALLY save and pay them off every month. It gets me 20%-30% off at Kohl’s and gets me about $70 of free merchandise at Victoria’s Secret every year, so I’m happy with it. If you can pay off store credit cards every month and use their rewards and perks wisely, they can serve as a great money-saving tool. Too many people fail to recognize the importance of never carrying a balance on these high-interest cards, so it’s great that you have such a good handle on yours! For the most part using coupons, ordering coupons and simply ripping one off of a tear pad or cutting from the paper is effortless. Anyone who passes up the opportunity to save hard earned money simply doesn’t want the savings bad enough. I always speak up as a customer politely if I don’t get what I am supposed to get. Most times people do brush it off for fear of being looked down at. Don’t ever feel that way, especially when you work hard for your money. Great tips. Great advice! Using coupons and discounts for things you already plan to buy is definitely a no-brainer. I tend to spring for the extended warranty for cheaper items. My wife’s computer headset has a 90 day warranty. Her last headset died after 6 months. It’s been more than 90 days from this purchase, so if this one dies, the warranty will have more than paid for itself. I’m glad to hear you’ve made extended warranties work for you! I think my problem with extended warranties is that they’re only beneficial if the product I just paid money for dies before it should. I think it’s better to invest a bit more in an item that will last longer than buying something cheaper along with an extended warranty. This is especially true if the cost of the cheap item and extended warranty ends up being close to the cost of the better-quality item. In terms of number three, I always find it helpful to weigh the cost of the time spent for a certain activity, as well. Great point, Mike. There’s definitely a disconnect between the monetary value of our time as it relates to our spending habits. In addition to the time you spend to save money (and whether it’s worth it), there’s also the consideration of how much time we have to work to pay for an item we want. If shoppers thought about a new outfit or gadget in terms of how many hours it takes to earn the money for that item, they may think twice! I have NO money to lose, so I´m all about writing down shopping lists when I go to the grocery stores, AND I´ve been doing a shopping ban for over 4 months, so no new clothes, accessories or div stuff. It has really helped with my spending habits! That’s amazing! A shopping ban is one of the most effective ways to not only pay down debt quicker, but to understand exactly where you’re money is going. I bet you realized pretty quickly how much money was going toward things you don’t even miss now that the ban is in effect! Great job! All great tips, Andrea. I was a huge “spaver” before our dive into budget consciousness this year. What a huge waste of money! “Budget consciousness.” I love it! “Spaving”is definitely one of those things we don’t realize we’re doing until someone points it out! This piece is very well-written. It is imperative to get rid of these negative buying attitudes. Impulse buying is a no-no while comparing prices is a must for all shoppers. It’s time to make good buying decisions. Yes, it’s high time we stop letting retailers and manufacturers get the best of us! It’s isn’t always easy to walk away from an item when you feel the urge to buy, but in the end it will pay off when you can retire rich. Great article! I am always looking for ways to save money. Before I became I stay at home Mom, I would spend money freely. Since I became a Stay at home Mom and have begun to save money like it’s one of my jobs, I am surprised by how many things I was buying before that were just cluttering up my life! This weekend, I was asked if I would like to open a store credit card to save 15% off my purchase. Before, I would have said yes, but now I tell them that I am trying to cut back! Hi, wonderful tips there! In fact impulsive shopping is something even I am guilty of..though I am fairly adept at securing the discounts that I am entitled to! Hoping to cut down on the negatives a bit.. this post has proved to be of great help! Thanks!